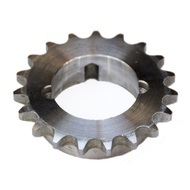 These sprockets give you the flexibility to use the same sprocket with different shaft diameters. Simply choose compatible tapered bushing (sold separately) with the bore sizes you need. All are made of steel and have hardened teeth. Use with ANSI 50 single-strand chain.